I’m not an extreme nail polish junkie but I do love to have a little variety in shades and finishes. 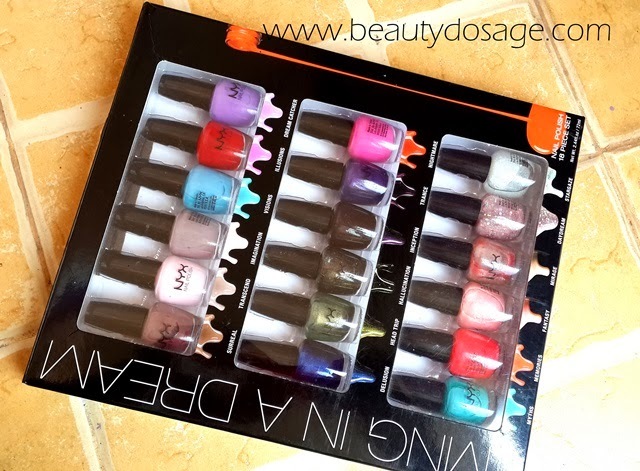 A great way to experiment with shades is by getting a set of mini nail polishes. 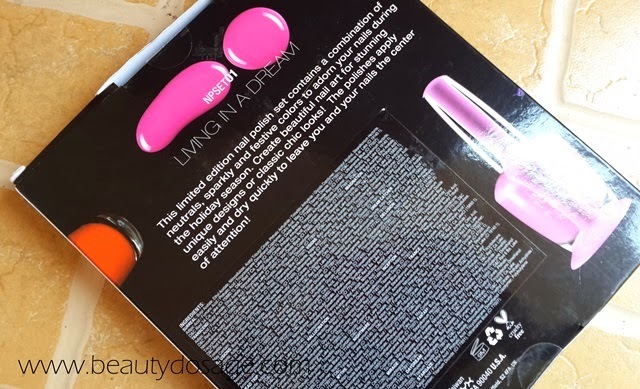 The NYX Living In a Dream set consists of 18 mini nail polishes in a variety of shades and finishes. What does NYX say about this product? This limited edition nail polish set consists of a blend of rich neutral, sparkly and festive colors to wear during the holiday season. Treat your nails to your own creation using any of the polishes to make your own design or a classic chic look! Easy application without the long wait of drying will leave you and your nails looking stunning. I like the concept of a set since I’m a person who don’t wear nail polish often so I’m never going to through an entire 15ml full size nail polish. The shades in this set range from dark shades to right summer shades to fun glittery top coats. The quality of the nail polish shades are amazing. They remind me a lot of the NYX girls nail polish with the opacity and longevity. I usually need a maximum of 2 coats for an opaque coverage and that lasts for at least 4 days before starting to chip off.